Based on the first quarter Sunday it looked as if the Vikings were right in their element Sunday taking on the Bears at Solider Field. But as quickly as they seemed to build it, the team couldn’t hold a 10-0 lead, and fell to the reeling Bears 21-13 to fall to 4-6 on the season. The Vikings had a shot late to possibly tie the game, but Bears DB Ryan Mundy intercepted Teddy Bridgewater’s 29-yard pass in the end zone in the closing minute to seal the defeat. Even playing in flurries most of the day, Bears QB Jay Cutler, torched the Vikings defensive backfield for 330 yards and three touchdowns in the win. The Vikings went up 10-0 when they ran a successful fake punt and Andrew Sendejo went 48 yards to set up a Bridgewater to Rhett Ellison 7-yard touchdown. Blair Walsh hit a field goal to make it 10-0 in the first 15 minutes, and all seemed to be going the Vikings way. Less than two minutes into the second, the Bears got on the board when Cutler hit Alshon Jeffery with a 27-yard touchdown to make it a three-point game. Chicago took the lead with just under three minutes left in the half when Brandon Marshall hauled in Cutler’s 44-yard throw to make ti 14-10 at the half. Bridgewater threw for just 158 yards and touchdown. The Vikings put up 96 yards rushing, but after Sendejo the leading rusher was Jerick McKinnon with just 38 yards. Jeffery had 135 yards receiving and a touchdown catch, and Marshall added 90 yards and two TD receptions, including a 4-yarder in the fourth quarter that made it an 11-point game. Matt Forte ran for 117 yards. 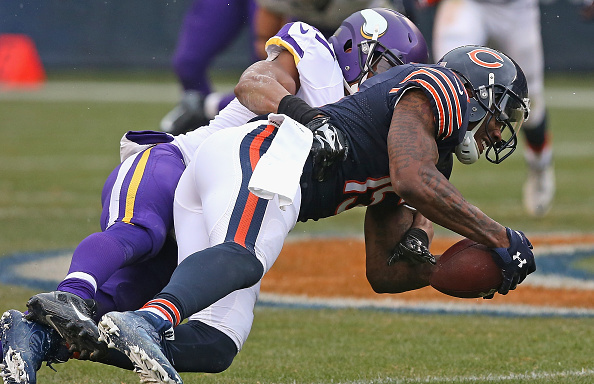 The Vikings were held to 243 yards, while the Bears amassed 468 yards in the win. Minnesota will take on the Packers at home Sunday.